1912: Alfred Ritter and his wife, Clara, founded a chocolate factory in Bad Cannstatt, Germany. 1919: They introduced Alrike, their own chocolate brand, to the market. 1930: The company relocated to Waldenbuch. 1932: The square bar we know and love today was created. Clara Ritter set out to make a unique chocolate barâ€”one “that fits into the pocket of every sports jacket, doesn’t break and still weighs the same as a normal long bar of chocolate.” Welcome Ritter’s Sport Chocolate. 1952: Founder Alfred Eugen Ritter dies at age 66. His son Alfred Otto Ritter takes over. 1959: Founder Clara Ritter dies at age 82. 1960: Alfred Otto Ritter decides do away with the production of long chocolate bars, pralines and hollow chocolate figures. Instead, production is focused on the chocolate square, and the Ritter Sport brand is born. 1970: Ritter Sport is recognized throughout all of Germany when the country’s first-ever chocolate made with yogurt is introduced by the company and a national TV commercial debuts. Germany is also introduced to the “Quality. Chocolate. Squared.” slogan. 1974: Each Ritter Sport bar is assigned a colored packaging. 1976: The revolutionary snap-open pack is introduced. 1978: A third generation of Ritters takes over the company. 1982: The miniature square bar is introduced. 1991: The switch is made from composite materials to fully recyclable, single-material packaging made of polypropylene. 2002: Ritter Sport begins producing approximately 30% of its own electricity and 70% of its own heating needs. 2004: The candy is now available in more than 70 countries. 2007: Ritter Sport makes the switch to 100% natural flavorings. 2008: An organic line of chocolate bars in introduced. Phew, that was a lot of history. But even by just reading these company highlights, it’s evident that Ritter Sport is more than a family of chocolatiers. They’re successful entrepreneurs whose family values, innovative mindset, compassion and environmental interest have set them apart from other candy makers. Eat your way through all the flavors available in your country. Visit the award-winning special 100 Years website. Buy some for your friends. Book a trip to Germany so you can try the special anniversary bar (pictured above). 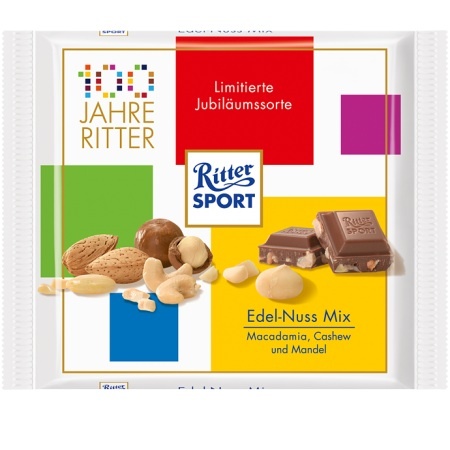 In a league of their own, Ritter Sport has spent the past decade flirting with chocoholics worldwide, titillating our taste buds, wooing us with masterful flavor combinations and colorful, inventive snap-open packaging. Hopefully this decadent German chocolate love affair shall continue for years to come. Another tasty blog by my favorite author! On my out the door to get a Ritter Sport right now! Happy 100th!!! Streets smell like chocolate? I’m booking my trip now.